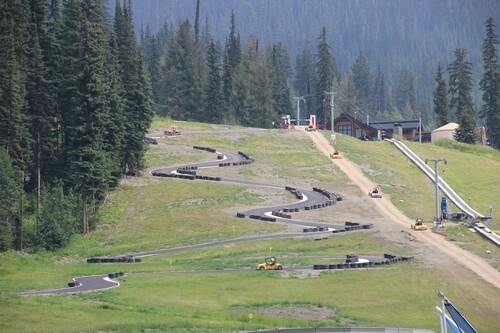 New and Exciting Sun Peaks Summer Fun – Sun Peaks Go Karts are now here! Sun Peaks ski resort recently became the first operator in North America to offer a thrilling MCC downhill go kart track when it opened on June 26, 2015, and initial accounts were that the course is 'wild' and awesome'!. Construction began in early fall of 2014 with the course being dug into the mountainside right beside the Platter Lift at the base of Mt. Tod and Sundance Mountain. It is now in full operation during the summer and you can hear the tires squeal and see the big smiles at the finish line! 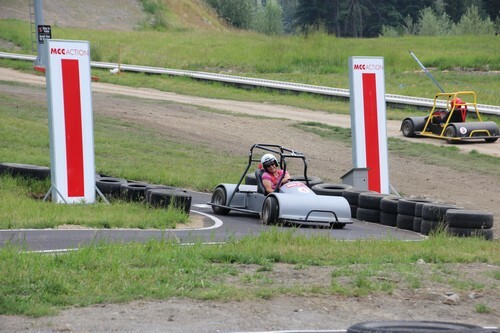 The downhill Go Kart track is 512 metres (1,680 feet) long and has a vertical descent of 52 metres (170 feet) which will allow for speeds up to 35 km (22 miles) per hour. 4 timed runs for $25, ($15/person for a 2nd set of laps on the same day) and the rules have changed again to now be you must hold a valid driver's license or learner's permit (proof required) AND be at least 150 cm tall to participate. 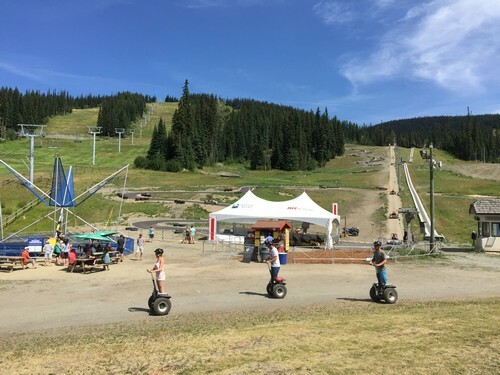 Starting in the summer of 2017, a new zone has been created at the base of the Sun Peaks Cross Cart course for younger guests to join in and get a taste of the excitement. What are Sun Peaks Go Karts (MCC Mountain Cross Carts)? MCC go karts, are cool little go karts with a low centre of gravity to allow for added stability, with no noisy or smelly engines to worry about. Riders will have the Sun Peaks Platter Lift to pull them up the mountain, and gravity will quickly get you back down to the bottom and wanting another go. Even with these fairly high speeds on a windy downhill trail, the mountain cross carts are very safe and offer excellent control with precision disc brakes, a 4 point safety harness, roll bars and padded seats. The runs will be timed thanks to a timer at the bottom, so you can challenge your spouse or buddies to see who is the tops in downhill cart racing. These gravity-fueled, adrenaline-powered, rubber-burning go karts are a blast and instantly became a huge success when they first opened in 2015, and they open each spring in late May or early June, as soon as weather permits. Nine other Mountain Cross Cart parks are in operation around the world, including in Sweden, Norway, Estonia and Finland. Check out this Sun Peaks Go Kart video to get a good idea of what to look forward to, and then plan your Best Sun Peaks Summer Vacation now! Need accommodation? Check out our selection of Best Sun Peaks vacation Rentals. Fun for all drivers and we can’t wait to be kids again to enjoy this and the many other Sun Peaks summer activities. More details to come as Sun Peaks gets this course ready for action! Mountain Cross Carts at Sun Peaks Resort - Extended Version from Sun Peaks Resort TV on Vimeo.